Take your vows or celebrate your special day at one of our four lavish ballrooms, an open poolside terrace, an enchanting banquet on a floating boat, or a lovely garden by the lake. Weddings in the city are seldom this fine-looking. We lay out a sumptuous spread of the most delightful local and international cuisines, so that you and your guests can truly relish the wonderful occasion. From delish appetisers, to a rich main course, to divine desserts, all of it ensures your wedding leaves an aftertaste that is fondly remembered for years to come. 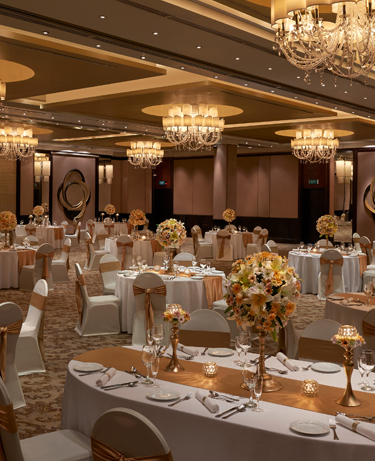 Celebrate your wedding in all royalty at our master ballroom punctuated by rich food, magnificent décor and a baronial ambience. Enjoy the beauty of this occasion at our lovely gardens by the lake. Trust an array of international cuisines and our floral décor to make it a gorgeous experience.